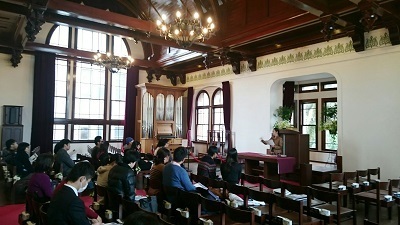 “Doshisha Chapel” is beautifully decorated with Stained-glass. 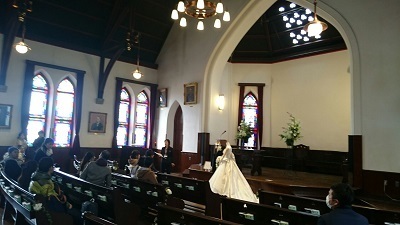 Today, we held an “Inspection visit and consultation meeting” for the wedding at Clarke Chapel in Doshisha University. All the LST staff would like to thank for the guests who came to visit the event. The chapel must be full of memories of the school-days. 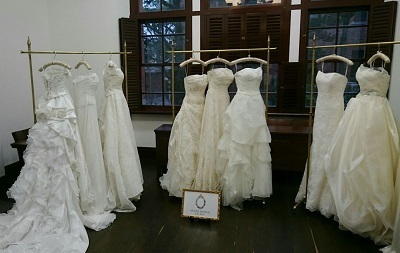 A wedding ceremony taken place in the solemn atmosphere surrounded by music from the pipe organ will certainly be unforgettable experience for the bride and groom, the families and the guests.